Women’s suffrage. World War I. The Great Depression. The Dust Bowl. Americans confronted these trials of the first half of the twentieth century with great courage and determination. 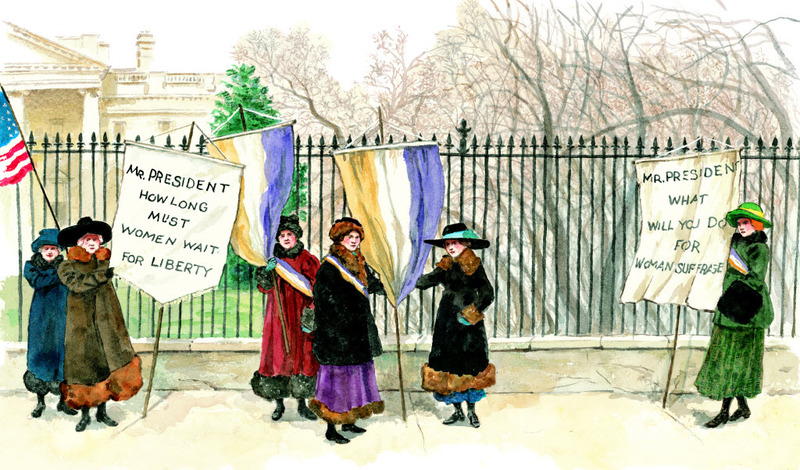 The fifth chapter of Our White House, “Part V. With Courage and Determination,” explores these topics and more through fiction, nonfiction, a comic strip, poetry, and breathtaking original illustrations. If you do not have a copy of Our White House in your classroom or home, please consider checking out a copy from your local library or purchasing one online here. To print the Education Resource Guide that includes activities and discussion questions regarding the content included in Part V of Our White House, click here. The table of contents for Part V of Our White House is listed below. To the right of each article or illustration title, in the “Read More” column, are links to relevant, supplemental content on this website to help you expand the educational potential of the book’s contents. OUR WHITE HOUSE. Illustration © 2008 by Emily Arnold McCully. Reproduced by permission of publisher, Candlewick Press, Somerville, MA.